Soldotna Campgrounds and RV Parks — complete list of all the RV parks in Soldotna Alaska and within driving distance of Soldotna. 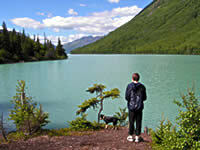 State Campgrounds, Private Campgrounds, Soldotna RV Parks and Free Camping in Soldotna. Fred Meyer offers Free Camping, Soldotna RV Dumps, Potable Fresh Water and Gas, Diesel and Propane Too. Read through this list of RV parks in Soldotna for some ideas on places to stay with full hook-ups or at least electric and water for your RV. Soldotna Alaska is located on the Kenai peninsula and is the main center of commerce for the borough in reference to camping and RVing. See Soldotna RV Parks with Full Hookups and Soldotna RV Parks with River Access. King Salmon RV Park and Campground in Soldotna AK. This list of RV parks in Soldotna is divided into to groups including locations both with hook-ups and without. This list of places offering free camping in Soldotna is listed as a courtesy to those not looking for the great outdoor experience but rather needing to save money on camping fees. There is the typical parking lot boondocking available in Soldotna Fred Meyer parking lot and then there is another open gravel area off Funny River Road on Airport Heights Street we see lots of folks boondocking in. Most of the folks we spoke with were Alaskans down from Anchorage or up as far away as Fairbanks. Also the large part of were military personal camping in tents in a grassy area along an old runway. Soldotna Sporting Good Stores: You can find most all services in Soldotna from the one and only major sporting goods retailer on the Kenai Peninsula plus three very good sporting goods retailers in Fred Meyer, True Value Hardware, and Wilderness Way. Free camping is available in both the Walmart and Lowes parking lots in Kenai Alaska. While Fred Meyer offers some important services like food and restaurants within walking distance, gas and diesel, propane, potable water and a dump station this is not the case at either of these locations in Kenai. Basically, it's just a place to park and camp but expect plenty of noise and traffic all through the night.